TOKYO (AP) — Japan's Jiroemon Kimura, who had been recognised by Guinness World Records as the world's oldest living person and the oldest man ever, died Wednesday of natural causes. He was 116. Kimura, of Kyotango, Japan, was born April 19, 1897. Officials in Kyotango said he died in a local hospital, where he had been undergoing treatment for pneumonia. According to Guinness, Kimura was the first man in history to have lived to 116 years old. 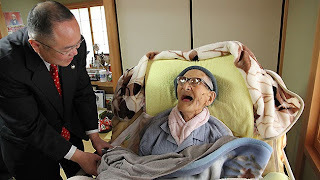 Kimura became the oldest man ever on Dec. 28, 2012, at the age of 115 years, 253 days, breaking the record set by Christian Mortensen, a Danish immigrant to the United States, whose life spanned from 1882-1998. The title of oldest living person is now held by another Japanese, 115-year-old Misao Okawa, of Osaka. Okawa was born March 5, 1898. "Jiroemon Kimura was an exceptional person," said Craig Glenday, editor-in-chief of Guinness World Records. "As the only man to have ever lived for 116 years — and the oldest man whose age has been fully authenticated — he has a truly special place in world history." Kyotango officials said Kimura's funeral would be held Friday. "Mr. Kimura was and will always be a treasure to our town, to our country and to our world," said Mayor Yasushi Nakayama. The new oldest living man, according to the U.S.-based Gerontology Research Group, is James McCoubrey, and American who was born in Canada on Sept. 13, 1901. Now 111 years old, he is the 32nd oldest living person according to GRG's list, which shows all those older than him are women.